Consistent withGB/T9138-1988 standards and JJG817-93 statutes and JGJ/T23-2001 technical regulations. 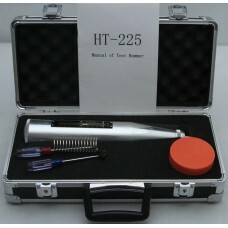 HT-225 Concrete Test Hammer generally applied to building components, bridges and all kinds of concrete components (panels, beams, columns, bridges) strength. 3) Pointer slider with external spring ring structure, both convenient for the friction adjustment, and ensures that the pointer shaft and pointer slider friction uniform, to ensure the accuracy of the instrument. Peer-products is relatively high accuracy, quality and cheap, long service life.